ROKPA: Medical Emergency Aid | In the Tibetan regions of China public health care insurance is not offered by the State. By funding for medical care ROKPA provides an uncomplicated emergency relief. ROKPA is saving lives by providing funding for major and minor emergency surgeries. We support poor people; our organization helps individuals without money who are in need. ROKPA provides unbureaucratic emergency relief and organizes necessary treatments for sick or injured children, as well as for adults. Health insurance in the Western sense does not exist in China. The state now contributes 60% to hospital costs, but only if the hospital is situated in the same province as the patient's place of residence. In the sparsely populated Tibetan areas of China, however, the hospitals are not equipped for all cases of illness. If it is a specialized clinic, the family continues to bear the full cost. The inadequate medical infrastructure and the prohibitive treatment costs mean that people with severe illness or injury have little or no access to modern medical care. Often, therefore, diseases are not recognized or not recognized in time, the health condition of those affected is worsened, and actually curable diseases can even lead to death. 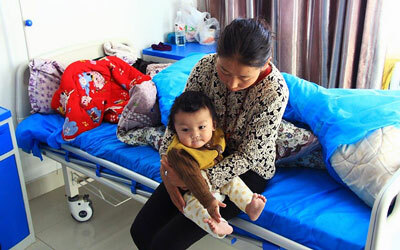 22 year old Yangzom Chutso from Yushu is the mother of a 6 month old baby. The boy has suffered from an anomaly in his abdomen since birth. When urinating, the urine flows out of his navel. His belly is also very inflamed in this area. Yangzom Chutso was referred to the hospital in Xining by her doctor in Yushu. There, an operation was recommended, which, however, can only be carried out by specialists in Chengdu or Beijing. The surgery costs together with the hospital stay equivalent to about 40,000 francs - unaffordable for the single mother who works in Yushu in a restaurant. Yangzom Chutso launched a collection campaign with friends and family members. When ROKPA heard of her situation, she had about half the sum required. Since the operation had to be carried out as quickly as possible, ROKPA paid the mother some of the missing funds from the medicine fund.